Guinea Bissau is turning into the African continent’s first narco-state, a country in which the violence stemming from the fight to control the cocaine that passes through the country could get even worse. (From Monterrey) THE DOUBLE ASSASSINATION in Guinea Bissau that occurred this past March 1 and 2 and took the lives of the army chief of staff, Tagme Na Wai, and the president of the republic, João Bernardo Viera, has caused the structural crisis in the former Portuguese colony in Western Africa to reach new heights. However, even though violence has been common in Guinea Bissau ever since the country gained independence, the method employed to eliminate the army chief, a bomb below the staircase leading to his office, more closely resembles an act of organized crime than one carried out by traditional military forces who are more apt to use high caliber weapons. What’s more, no one has been imprisoned or even arrested for either of the crimes. This has led to speculation that narco-trafficking had a shady role in the double assassination, or in at least one of the two. However, political violence is not exclusive to Guinea Bissau. A few hours after the death of President Conte of Guinea (Conakry) last December 26, captain Moussa Dadis Camara took control and self-proclaimed himself the head of state. On August 6, the president of Mauritania, Sidi Ould Cheikh Abdallahi, was deposed for attempting to make the army leader resign. Along the same lines, in Uganda, President Museveni recently warned that if opposition leader Dr. Kizza Besigye wins the 2011 elections, the country will be plunged into a civil war. The double crime committed in Guinea Bissau has as much to do with drug trafficking as the existing inter-ethnic rivalries in the country, and even the opposition between Guinea Bissau’s two recently deceased big boys. Twenty three years ago, in view of President Vieira’s repressive politics, the army chief warned that the day of his death would also be the last day of the president’s life: a prophecy that, for all intents and purposes, was fulfilled two weeks ago. “The legacy of three decades of personal power is that the former colonies have been reduced to the poorest and most conflict-stricken countries on the African continent, with per-capita incomes that are among the lowest in the world” Violence was the one constant in João Vieira’s regime, which controlled the country for almost its entire three decade long existence as an independent state until the leader’s recent violent death. Threats of a coup d’état were commonplace during Vieira’s stint in power. Last August, an attempted military coup ended with the detention of the admiral José Américo Bubo na Tchuto. Three months later, another putsch failed, but it cost a soldier his life when a group of infantrymen attacked the president’s residence with powerful weapons, driving Vieira to personally hire a 400-strong militia. The attempted assassination of the army chief in August 2009 allowed the army to dissolve Vieira’s personal guard, which made his assassination on March 2 much easier. As Robert Mugabe did in Zimbabwe, Nino (Vieira’s nom de guerre), a hero of the independence movement and the commander of the anti-colonial guerrilla, turned the country into a corrupt system corroded by narco-trafficking and violence between rival groups, and one of the poorest countries in the world. Both leaders came to power in 1980: Vieira when Guinea Bissau broke away from Cape Verde and Mugabe when the white minority ceded control of the country to its pro-independence party, ZANU. However, the legacy of three decades of personal power is that the former colonies have been reduced to the poorest and most conflict-stricken countries on the African continent, with per-capita incomes that are among the lowest in the world and high levels of unemployment: in Zimbabwe, it is over 80 percent of the working population. Furthermore, life expectancy in Guinea Bissau does not surpass 45 years. In the latter country, Vieira governed following the elimination of Luís Cabral, half-brother of the Father of the Nation, Amilcar Cabral, and the country’s split from Cape Verde (the rivalry that existed between Cape Verde and Guinea Bissau after the latter’s independence was fundamentally due to the ethnic nature of the two groups: Cape Verdeans being of mixed origin and with a higher level of education, and the inhabitants of Guinea Bissau being more native, but of a lower economic status. Today, despite the nonexistence of riches or water for farming, the income of the island-nation of Cape Verde is three times higher than that of its former continental political brothers) in 1980 until the coup of 1999, only to return once again in 2005, after some relatively democratic elections. During his regime, which was dominated by the Papel ethnic group, repression against the Balantas, who at 32 percent of the total population comprise the country’s largest ethnic group, was ceaseless. 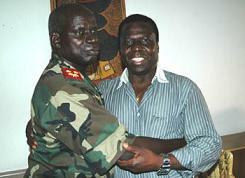 Ansumane Mané, the soldier who led the coup of 1999 and was later eliminated by Vieira, and Kumba Ialá, the president for a short time around the turn of the millennium, as well as the army chief Na Waie, assassinated this past March 1, probably at Vieira’s behest, all belonged to the Balanta ethnic group (Mario de Queiroz Guinea Bissau: Live by the Sword, Africanews, March 5, 2009). With the philosopher Ialá’s leadership, this minority ethnic group, which had been marginalized during the first Vieirist period, attempted to revamp the power system and eliminate the hegemony exercised by the Papels – the former president’s ethnic group – over the state’s structures. However, the country’s biggest problem is drug trafficking, which has been denounced by various international organizations, including the United Nations, but remains a taboo subject in the country. Guinea Bissau is becoming the African continent’s first narco-state, a scourge that has already ravaged the American continent in countries like Colombia and Mexico. There has been a proliferation of fake pharmaceutical companies in Guinea Bissau in order to transport cocaine and methamphetamine under the guise of medicine; this has turned the country into the drugs’ principal port of entry to the African continent before they make their way to Europe. Colombian and Brazilian groups, taking advantage of the language similarities and the state’s structural weaknesses, have gained a foothold in the country, corrupting the highest levels of government. The pressure and threats directed at judges have not allowed even a single drug trafficker to be detained, in spite of seizures of large quantities of drugs, such as those in September 2006 and April 2007. A portion of the confiscated drugs is even being returned to the traffickers so it can be sent to the European continent. According to Interpol, around 300 tons of cocaine pass through Guinea Bissau each year, en route to Europe via Portugal and Spain. The more than two billion dollars’ worth of narcotics that cross Guinea Bissau’s border represent more than double the country’s entire Gross Domestic Product. The sum is large enough to infest every government structure with corruption, including the army, the government’s security forces. General Na Wai had tried to reduce the influence of the organized crime that had infiltrated the power structure, despite the fact that the United Nations has accused the army itself of protecting organized crime. Despite the weakness of the government and the national structures, as well as the corrupt regime and narco-trafficking, the transition of power was carried out according to the constitutional process. The soldiers who had eliminated the head of state did not grab the reins, and allowed for a civil political continuation. Indeed, the Parliament’s spokesperson, Raimundo Pereira, was named the constitutional successor to convene presidential elections for the formation of a new government. The return of calm to Guinea Bissau aside, its neighbors – Senegal in particular – fear a worsening of the violence caused by the fight for control of the narco-trafficking routes, and the spread of organized crime within their own borders. A narco-state in Guinea Bissau would be mean an even greater cocaine distribution center, and a source of destabilization for the region.